An Interview with Reshma Shetty, Co-founder of Gingko Bioworks. "I'd never try to encourage someone to become an entrepreneur. Instead I would encourage them to figure out what they are passionate about, what they want to change about the world and what they want to achieve with their life. Then figure out the best way of making that happen." 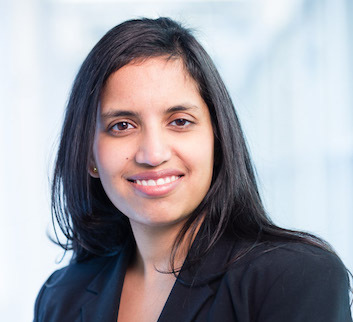 Reshma Shetty is a co-founder of Ginkgo Bioworks, an organism design company building organisms to spec for customers across markets including nutrition, health and consumer goods. The company's organism engineers work directly with customers including Fortune 500 companies and government entities like DARPA to design microbes for their needs. Reshma has been active in synthetic biology for over 10 years and co-organized the first international conference in the field: Synthetic Biology 1.0. In 2008, Forbes magazine named Shetty one of Eight People Inventing the Future and in 2011, Fast Company named her one of 100 Most Creative People in Business. Reshma holds a Ph.D. in Biological Engineering from MIT. My role model is Tom Knight, who was my PhD advisor at MIT and is now a Co-founder with me at Ginkgo Bioworks. Tom is an amazing person - he literally helped to invent the internet and contributed to the rise of the whole computer industry. He lived through the massive transformation where computers went from being available at just a handful of universities in the world to being something that touches people's lives on a daily basis and makes them better. One day 20 years ago he started getting interested in biology, went back to school taking classes at MIT to learn all about it and ended up inventing a whole new area that is now called synthetic biology. Doing something like that takes a lot of courage and intelligence. Tom has the ability to look into the future and see what will be the most important fundamental technologies that will change the world. His ability to understand technology both broadly and deeply and see what's changing about the world is something I greatly admire. The great thing about Tom is that he also happens to be a kind person as well. I can only hope to measure up to him. The thing I am most recently proud of is the opening of Bioworks1, our first Foundry for engineering organisms. This is something we have been working towards for about a decade now: being able to engineer biology and ultimately build a factory for engineering organisms. It has finally become a reality and it's a bit surreal to actually see it in action. We were able to design a factory for engineering biology from top to bottom. Now we will be able to use Bioworks 1 to work on projects like engineering yeast to produce new cultured rose aromas and engineering probiotics to combat drug resistant infections. The possibilities are very exciting to me. Next step will be to build Bioworks2 to do the things we can't yet do in Bioworks 1. "The interesting thing about engineering biology is that it's about bringing together a whole host of ideas and technologies. You need a team of people who are passionate about this work, a suite of technologies that makes it tractable to engineer biology, the resources to make it happen, the business model to capitalize on these technologies and an understanding of your customers who will be buying these organisms. There is no one magic silver bullet." It's about bringing all these things together. That is what has been key to make Bioworks1 happen and to making Bioworks2 a reality in the future. I am incredibly proud of the team we have assembled and what we have achieved so far. Ginkgo's mission is to make biology easier to engineer. Before we even had a name for our company, we wrote down what our mission would be. We are tremendously excited about what biology can do and its capabilities. The idea that you can design biology is a compelling idea to me and has been so for a long time. I consider my challenge day in and day out to build a company worthy of that mission and that has the resources to execute on it. I can't say that I faced really significant challenges as a woman. I have been fortunate to have my professional career develop at a time where a lot of people before me fought those battles. So cases of overt sexism are becoming more rare. "I think the challenge most women face today is generally a subtler form of bias than previous generations faced. Because bias today tends to be more of an unconscious bias that frankly both men and women can have, it is harder to point your finger at it and stamp it out." While it's good that overt bias is no longer acceptable, it is a more insidious challenge for people today to eradicate unconscious bias. "Ginkgo is an organism company, where we literally design, build and test our organisms, much in the same way a programmer might write a piece of software, or an architect designs and builds a house. Unfortunately, right now, building organisms is hard. It's much harder than writing software or building houses." As I said before, there is no silver bullet to making this happen.Thus, the key to Ginkgo's success to date and what will be important to our success in the future is nailing a lot of different things: bringing together a suite of different technologies, having a smart business model, talking to customers to understand deeply what their needs are and how Ginkgo can deliver against those needs. Finally, having the ambition to do something very big and world-changing is another key driver for success. You need the team that respects that challenge and is passionate about working together to tackle it. All of these things coming together are key to bringing about Ginkgo's success. "If I had to look back, I would say that my regret usually comes from those times when I let fear stop me from doing something. Whether it was passing on taking up a new responsibility or opportunity due to fear of not being able to do it justice, or not speaking up because I was afraid of how people would react. So if I could do one thing differently it would be to not let fear rule me in those circumstances." There is even a name for the psychology behind this fear: 'imposter syndrome'. It's actually really good that there is a name for it, because it makes you conscious of it and automatically gives you some of the tools to recognize it in yourself and fight back! I didn't set out to become an entrepreneur. I realized that my goal was to make biology easier to engineer and I decided that starting a company was the best way to achieve that. Focus on what you want to do, not what you want to be. I try to surround myself with people who are smarter than me and from whom I can learn a lot. Then I do my best to give them the support they need to succeed and otherwise get out of their way! I also try to be very honest and frank with people. I think people benefit from a culture where they feel comfortable and are encouraged at every turn to speak what they believe. I tell my team that I absolutely want to hear their opinions about what we are doing and what needs to be done. I will deeply consider what they say and then I'll make a call. They may not always be happy with my decisions, but they should know that they are heard. It's really important to create a culture of openness and understanding within a team that not everything will always go your way, but your voice will always be heard. "I would tell myself to not worry so much about making mistakes. It's very easy to fall into a trap where you worry too much about making a wrong move and then suffer from analysis paralysis. In reality, it's usually better to just make a decision and move on." It turns out that there are very few mistakes that you can make that are unrecoverable. That's one of the biggest things I've had to learn - how to make decisions in the face of imperfect information. I'm an engineer by training, so I always want to have all the information at hand to make that perfect decision. But that's usually not how life works! "My goal is to grow Ginkgo into the best bioengineering company in the world. I'd like to be able to engineer organisms as reliably as civil engineers can engineer bridges, or electrical engineers can design computer chips. I believe that if we can actually pull off engineering biology, the sky is the limit." There are a million interesting things to do and a million problems to go solve. To do that, we need to focus on 1) getting the resources we need to make Ginkgo a billion dollar company and solve the problem of engineering biology. 2) continue to build our incredible team of dedicated, smart people and 3) show that Ginkgo works - that we are a profitable and sustainable business with a lasting advantage.
" Work on something important. Life's too short not to work on something important".